In a thick bottomed pan (uruli), roast green gram dal. Cook it in pressure cooker with required amount of water. Make jaggery syrup and strain it. Keep the syrup on flame. Add cooked green gram dal. Let it boil and thicken. Add ghee in between. From grated coconut, extract 2 cups of thick coconut milk, 5 cups of medium thick coconut milk and 8 cups of thin coconut milk. Add thin coconut milk to the green gram dal mixture and let it boil. Stir continuously. 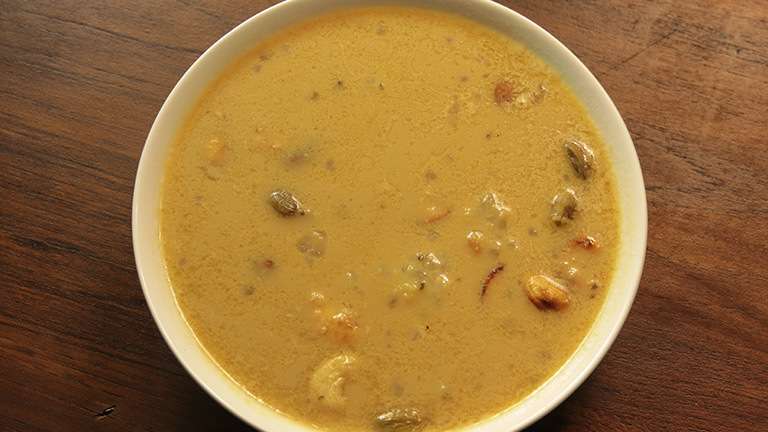 When the payasam thickens, add medium thick coconut milk and cardamom powder. Mix well and let it boil. Add thick coconut milk. Remove from the flame before it boils. Add ¼ tsp of dry ginger powder, cashew nuts, raisins and coconut bits roasted in ghee. Mix well and serve. Tasty payasam is ready.